My friend Elisabeth shared this link with me the other day and I thought it was such a great idea that I wanted to post it here. 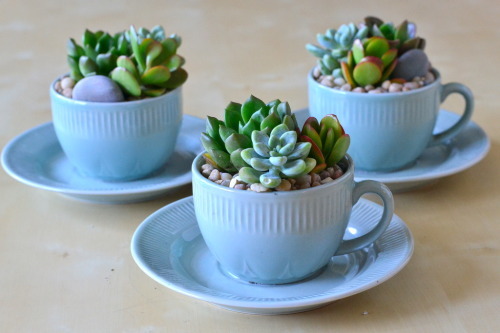 What an awesome idea to plant little succulents in teacups?! Next week I’m going to a plant sale so hopefully I’ll be able to find some cute plants. Then I’ll just have to make a stop at a thrift store to find some teacups and I’ll be set. I’d love to have them all over my balcony, I think it’s an interesting way to add some plants (and color) for fairly cheap. Previous Post Day 298. CO Mingle night! Next Post Day 300. Pippin has a tumblr! So cute! Another place to check for tea cups would be Ross, TJ Max and maybe even Tuesday Morning. These would be so cute on your deck.